SMBC Aviation Capital is one of world's leading aircraft leasing companies. 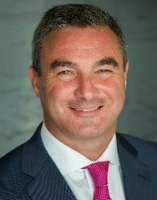 David joined the company in 2002 and was appointed to the role of Chief Operating Officer in 2004 with responsibility for overseeing the Operating Platform along with Risk and Asset Management of the company's $15bn aircraft leasing business. With over 25 years aviation industry experience, David has also held various international banking roles as Asia-Pacific Regional Head & Global Head of Aviation Finance and was based in Hong Kong for five years establishing and leading an aircraft and project finance business for KBC Bank N.V. David served as director on the Board of the International Society of Transport Aircraft Trading (www.ISTAT.org) from 2011 to 2017 and is currently on the Board of Trustees of the ISTAT Foundation. David has also represented SMBC Aviation Capital at the Aviation Working Group (www.AWG.aero) since 2004. David holds a degree in International Business and Economics from Trinity College Dublin and has completed various Executive Management programmes at Harvard and London Business Schools.